Dr Tewari [BSc, MBBS, MS (Ortho), FRACS, FAorthA] is a trained orthopaedic specialist and currently working as Senior Staff specialist in Paediatric and general Orthopaedics Hunter New England local health district. Dr Tewari has appointments at John Hunter Hospital, John Hunter children Hospital and Royal Newcastle centre with participation in on call trauma roster and is a conjoint lecturer at university of Newcastle. Dr Tewari has private rooms 214 Brunker road Adamstown with VMO appointments at Lingard Private Hospital, Newcastle Private Hospital and Warners Bay Private Hospital. Dr Tewari is a member of Royal Australasian college of Surgeons, Australian Orthopaedic Association and Australian Paediatric orthopaedic Society. The services provided include management of complex paediatric and adult orthopaedic problems such as cerebral palsy, DDH, deformity correction, hip and knee surgery including joint replacement, foot and ankle surgery and trauma. 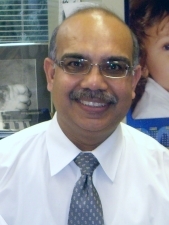 For further details about Dr Tewari's profile and his involvement in research, teaching and CME. Please refer to Dr Tewari's curriculum vitae.